She is appearing as the good witch Glinda in Wicked! 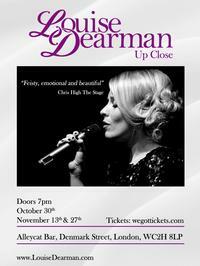 the Musical until 10th December, but you can also see Louise Dearman in concert at the Alley Cat Bar in Denmark Street on October 30th, November 13th & 27th. Louise is recording her second album in October so her Up Close Concerts are the perfect platform to showcase some of her new material.